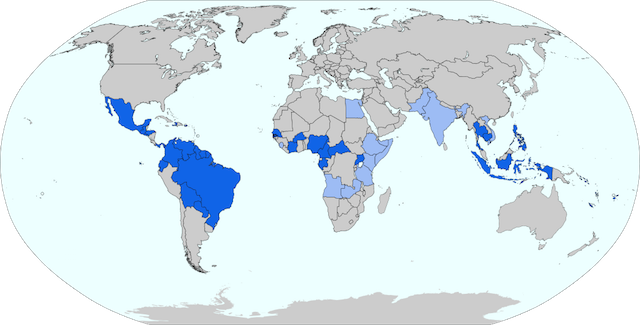 Distribution of Zika virus infections (past and present)WIKIMEDIA, FURFURZika virus infection has been linked to birth defects, but nearly 90 percent of the reported microcephaly cases have been confined to a northeastern region of Brazil. The geographic concentration of Zika-related birth defects has some experts wondering whether other factors may be at play, Nature News reported yesterday (July 25). “We suspect that something more than Zika virus is causing the high intensity and severity of cases,” Fatima Marinho, director of information and health analysis at Brazil’s ministry of health, told Nature. One possible explanation is socioeconomic—most of the mothers who have given birth to babies with microcephaly tend to be young, black, poor, and live in or near cities, according to Marinho. Another possibility is co-infection with other viruses, such as dengue or chikungunya. A third is low vaccination rates for yellow fever. Until researchers know more, public health experts should exercise precaution, virologist Ian Lipkin of Columbia University in New York City told Nature. Some scientists weren’t convinced. “That is really premature for them to say [that the outbreak is over],” infectious disease expert Michael Osterholm of the University of Minnesota told STAT. It could take several years before enough people gain immunity to the virus to prevent its spread, he said. And in Spain, a woman gave birth to the first baby with Zika-linked microcephaly, BBC News reported. Authorities said it is the first such case in Europe. The fetus was diagnosed with the birth defect in utero; the baby was born in stable condition, according to the BBC.